The City of Conway will host a groundbreaking ceremony for an affordable housing development on Thursday, March 28 at 10:00 a.m. for the new development being constructed in the historic Pine Street Neighborhood. The Spruce Street Cottages are set to begin construction this Spring. Ron Harris with Summerwood Incorporated will be the lead developer for this project. There will be a total of 12 homes constructed and the layout will follow a pocket neighborhood model, one of the first in Conway. The City has invested over $1.2 million of Community Development Block Grant funds into the area for land acquisition and infrastructure improvements for a private development such as this. Seven of the twelve homes will be eligible for a down payment subsidy for homebuyers. Potential homebuyers will have to meet the income limits outlined by HUD to qualify for the subsidy. The remaining 5 homes will be sold at market rate. The homes will be a mix of 3 bedroom 2 bath and 2 bedroom 1 bath. The purpose of this development is to create more affordable housing options in Conway — an initiative for Mayor Bart Castleberry. 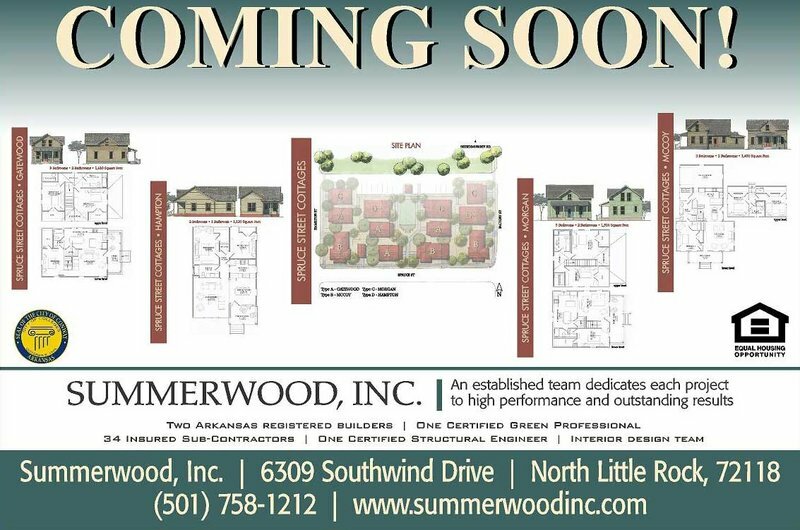 Call Summerwood, Inc. at 501-758-1212.